My name is Parusha (Peter van Suijlekom) and I'm from the Netherlands. At this shop, you can order all kind of magical items I make. Every piece is unique. Mainly Pentacles, pendants and seals/sigils. I'm a practitioner of the Magical Arts for about 24 years. I’m a practicing Alchemist as well. I was and am involved in different magical and mystical orders and received my alchemical training from different private teachers and now I have a A.’.A.’. Clerk House in the Netherlands. The is the first one in history (‘Heru Ra Ha Clerk’ House). I received teachings and practices from the East and the West. I discovered that Alchemy and the making of magical items are really my passion and that I yield very interesting results on many levels. My Path is the sum of all those different schools from the East and the West and coming together in the Art of Alchemy and Magick. Versatility has its strength and weaknesses. I decide to pick up the positive side of it. All other means I've learned are part of my magical toolbox in order to accomplish what we call 'the Great Work'. One is All, All in One. As result of my Work I made pentacles for my personal Work and they resonated perfectly with my Work. 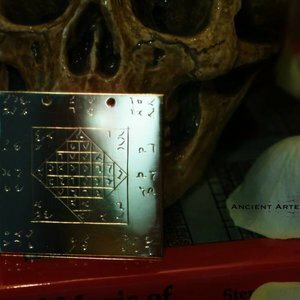 I worked hard to master the technique of engraving and the pentacles became more beautiful one after the other. Because the pentacles where so in harmony with my work, people around me asked if I could make one for them as well. So, I did! The people who received a pentacle from me, wrote that they benefited as well. It made me feel very grateful. My goal is to make sure you have an item that is precious to you. 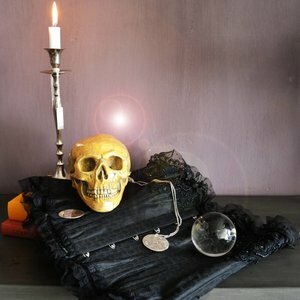 I make pentacles for the serious adapt or those who are aware of the energetic value of those items and make an instant spiritual connection with them. The pentacles are Artefacts they are crafted on the perfect hour of the day and most of them are made when the moon is waxing so they are charged with the proper energies. I make the items attuned to the costumers need and small varieties and adjustments can be made in order to let it work for you. This also means that it takes time to make the items. Thank you very much for taking interest and support of my Artwork.